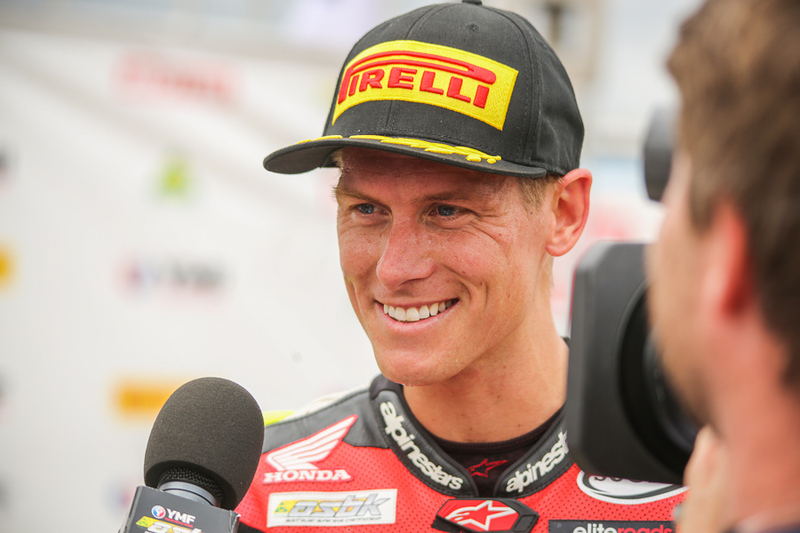 Troy Herfoss Secures 2018 YMI Superbike Championship! 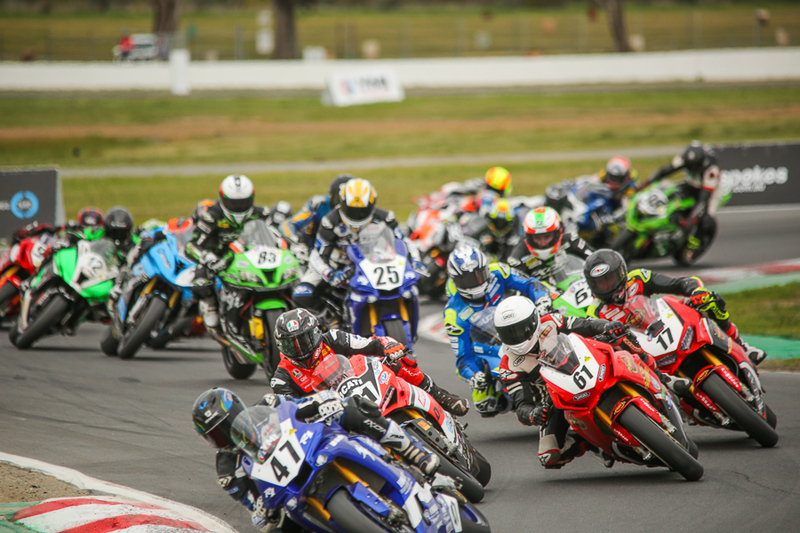 Troy Herfoss (Penrite Honda Racing, CBR1000SP) has captured the 2018 YMI Superbike Championship, in what was an epic showdown at the Spokes.com.au presents Round 6 of the Yamaha Motor Finance Australian Superbike Championship presented by Motul Pirelli (ASBK). He managed to wrap up the championship with a round to spare. Herfoss took out the first race which was filled with drama from the outset. It started off with a bang as Bryan Staring (Kawasaki BCperformance, ZX-10R) crashed at turn one. The race was soon red flagged as a result and the riders would have to re-start. When the race got back underway, Wayne Maxwell (Yamaha Racing Team, YZF-R1M) had a lightning start with Josh Waters (Team Suzuki ECSTAR, GSX-R1000R), Herfoss and Troy Bayliss (Desmosport Ducati, 1299 Panigale) in tow. Maxwell was pumping in fast laps but disaster struck when he crashed on lap eight. The Yamaha rider was obviously dejected as he realised it had ended his championship run for 2018. Waters had taken the lead after Maxwell had crashed out, but he now had Herfoss to contend with. Herfoss managed to hit the front with only five laps to go with a daring overtake. Bayliss was also starting to charge and contend for victory. As the race reached the concluding stages, an already crazy affair was brought to an end due to Adam Senior’s (Senior Engineering, Yamaha YZF-R1) bike catching on fire. As a result, the race was declared at the time of the red flag as two thirds of the race was competed. Taking the win was Herfoss who clawed his way through the field after having a bad start, followed by Waters and Bayliss on the podium. Crucially Herfoss had got the job done on the previous lap for his victory to be secured. Arthur Sissis (SA Demolition & Salvage, Honda CBR1000RRSP) had a phenomenal race to achieve fourth place and he appears to have his Honda dialed in around here. Daniel Falzon (Yamaha Racing Team, Yamaha YZF-R1) finished fifth, with Superbike rookies Mark Chiodo (Team Suzuki ECSTAR, GSX-R1000R and Ted Collins (NextGen Motorsports, BMW S1000RR) recording their best ever results in sixth and seventh. The fans would have to wait till race two to see if Herfoss could wrap up the title. This afternoon’s second YMI Superbike race two was once again full of drama. This time Herfoss would lead, but Maxwell would take the ascendency on lap two. Unfortunately crashes by Chiodo and Jamie Stauffer (Craig McMartin Racing, Ducati 1299 Panigale) would cause a red flag. When the race restarted, Nathan Spiteri (Livson, Suzuki GSX-R1000R) also crashed and that caused yet again another red flag. Upon the third restart, the race would be reduced to 12 laps and Bayliss would lead from Maxwell and Waters. With clear air in front of him it would be interesting to see if he could make a break for it, Herfoss was back in fourth. Maxwell made his move on lap three and would be looking to avenge his crash in race one. In the meantime, Herfoss was content in fourth, holding the championship points advantage he needed to secure the championship. At half distance, Waters was the fastest rider on track and looked like he had his mojo back on the Suzuki and was all over Bayliss in second. Waters got the job done on Bayliss on lap 10 and moved into second. Herfoss made a mistake and went too deep into a corner and looked to have backed off, to ensure he won the championship today. Staring passed Herfoss on the final lap. The Honda rider had done enough however, as Maxwell crossed the line to win the race, Herfoss had scored enough points to secure the 2018 YMI Superbike Championship! 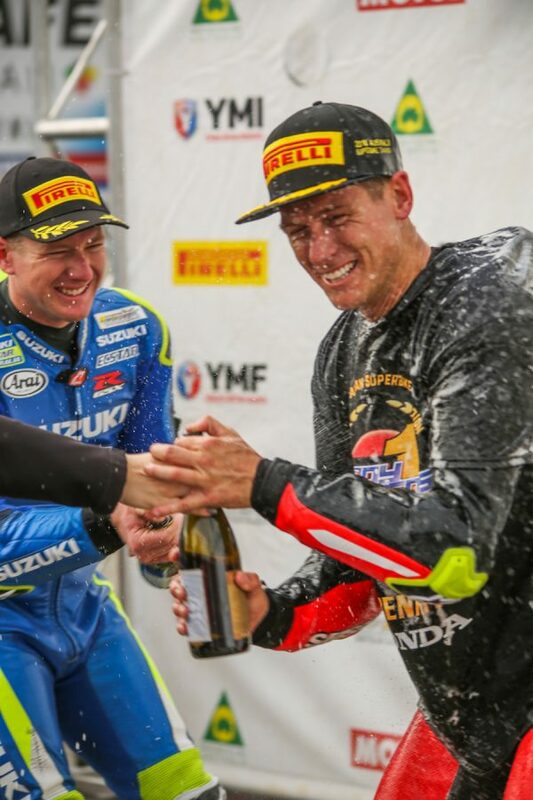 Herfoss was very emotional to secure his second ASBK Championship. Joining Maxwell on the podium was Waters and Bayliss in second and third. 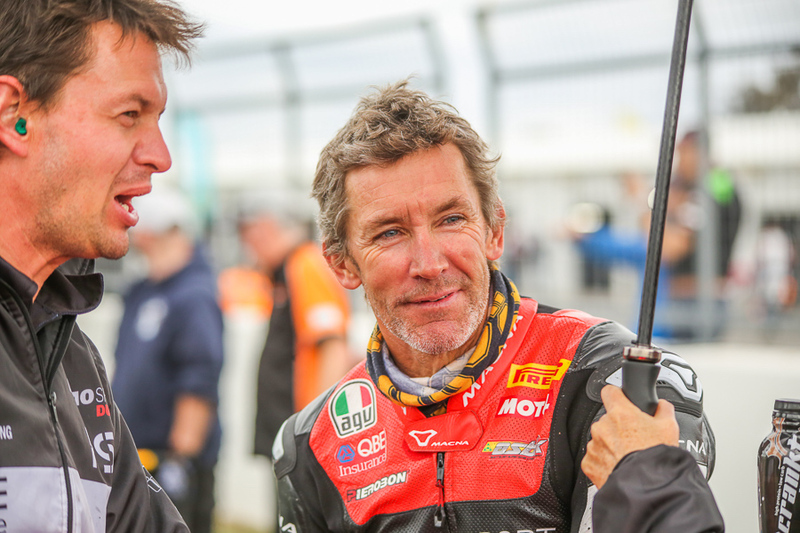 The championship may have been decided, but ASBK now looks forward to the championship finale at ‘The Island’ October 12-14. Its sure to be a great way to send off season 2018, with six classes battling it out for bragging rights.